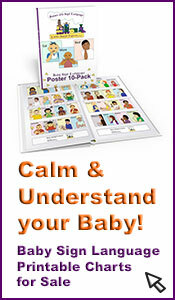 See our Baby Sign Posters for sale by clicking here! This is a very common question about baby sign language and naturally so. 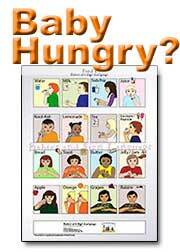 There is general agreement that teaching babies sign language can begin as early as six months for almost any infant. 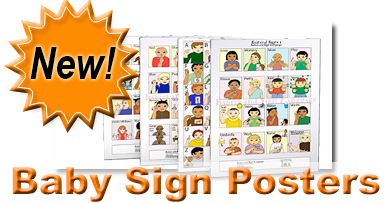 Some baby sign experts generalize by saying that Baby Sign Language is normally introduced between the ages of six to nine months. Frequently, the approach is for the parents to begin signing in front of the child while learning the hand gestures. Somewhere between six to nine months, your infant will typically use their first sign. The fact is that Baby Sign Language can be taught as soon as parents are able to make and keep consistent eye contact with their infant. Teaching babies sign language requires your infant to be able to focus on the hand movement and have the cognitive skills to connect a gesture with a particular item. For Baby to sign back, the he or she will also need some motor skills to make specific handshapes and movements. The pioneer researcher, Joseph Garcia, who is partially credited for developing the use of American Sign Language for baby signing, found that babies who see sign language regularly beginning at six months of age will normally begin signing on their own by about eight months. Of course, every baby is different. Some develop earlier than others. If you sense your infant is intellectually advanced, you can conceivably begin teaching Baby Sign Language as early as 2-3 months. This is not often, but it has been done. On the other hand, it is never too late to start teaching baby signing. 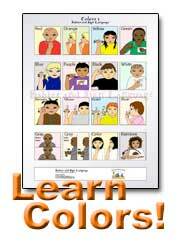 Teaching babies sign language when they are nine months old all the way up to thirty-six months old is common. A good way to judge when an infant is ready to begin using Baby Sign Language is when he or she can understand and use most simple hand motions. These include gestures for words like “hi” or “bye”, or Baby nodding head to mean yes, or shaking it to mean no. 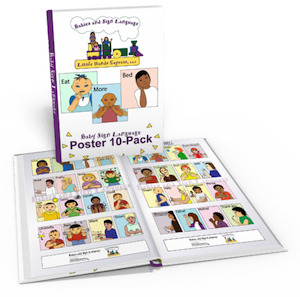 You will want to begin teaching babies sign language by signing words consistently while using or pointing to the item. It can be sometimes a slow process and takes a lot of patience and repetition at first. But once your infant signs his or her first word, others quickly follow. As a friendly suggestion, please wait to begin teaching your baby sign language until you are able to keep an infant’s attention. About 7-10 seconds is a good start. This is a key requirement. 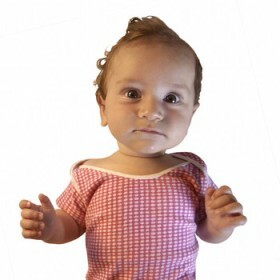 Your infant may seem confused at first and make funny faces! This just means that he or she is trying to figure out what you are doing when you are teaching him or her Baby Sign Language. Sign language for Baby is not hard to teach. It just means you as a parent and teacher to be alert to attempts to sign (by your baby). When your baby tries to sign, you want to praise and encourage him or her. It can take many weeks before your infant makes his or her first sign. If you begin to believe you started too early, please don’t quit! Please try and continue to sign - and when you least expect it - your infant will surprise you and sign a word! The first use of Baby Sign Language will probably be somewhat indistinct. Babies as young as six months do not yet possess a lot of hand-motor skills yet. As time goes by, the signs will become clearer. Teaching babies sign language is fulfilling with some patient instruction. Some researchers believe parents should begin signing in front of an infant as young as two weeks to two months old. You can begin teaching babies sign language on a child this young, but please don’t expect your infant to sign back before 5-6 months. Please remember to keep reasonable expectations otherwise a whole different set of frustrations may unnecessarily develop. Baby Sign Language is an amazing communication technique for infants. Teaching babies sign language normally begins when your child is around six months old. With patient repetition, parents and infants will begin enjoying a two-way conversation within the next two to three months. 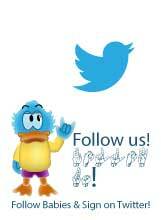 Enjoy, and do let us know how it’s going! Did you know babies already try to communicate on their own? Parents benefit from baby sign language too! How do I use signs with my baby? Can my toddler still learn sign language? Comments, Feedback, or Questions on Baby Signing?